Finally figured it out. This blog has grown in TOTALLY unexpected ways (and has grown me as well). Besides being interested in good, affordable wines, for me wine has become linked with travel. Last year’s trips to Portland, OR and Turkey to attend wine bloggers’ conferences and visit wineries changed my life. My favorite writing days, and my favorite Frugal Wine Snob blog posts, had to do with covering food as well as wine via winemakers’ dinners, and traveling to wine destinations. I’ve even become a travel agent and have organized a trip to Paris in April combining art, wine, and lots of walking. 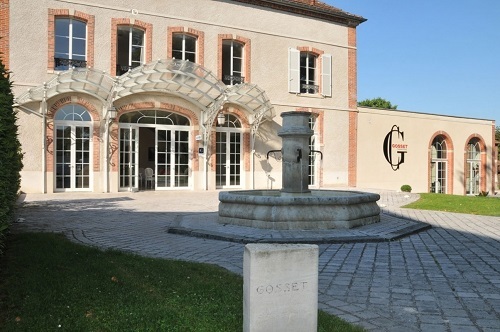 Among other visits, we’ll be touring the oldest winery in Champagne, Gosset House (1584). Coming soon: Barcelona and Priorat, Spain; Paris and Eparnay (Champagne region), France. This entry was posted in France, News, Spain, Travel. Bookmark the permalink. Good for you – it is always fun to reinvent oursleves!!! I am doing some reinventing as well. I am opening Latitude Wine Bar in Bluffton, SC toward the end of May. No specific date just yet, but it is a new chapter and a new direction. Have fun with all your travels and if they bring you to SC, please come by the wine bar so we can catch up!!! Thank you, Jean! Godspeed with your new venture; it sounds exciting. I enjoyed talking with you about this in Portland. I will definitely be in touch if I come to SC. Are you coming to Penticton in June?